Shinmai (新米) literally means “new rice.” Shinmai rice is the first crop of the season to be harvested. In order to be qualified as shinmai, the Ministry of Agriculture, Forestry and Fisheries in Japan states in the Japanese Agricultural Standard Rules that the rice must be processed and packaged for sale in the same year in which it was harvested. Shinmai usually becomes available in early fall and remains available only until the end of the year. The growing season for rice starts in March, when farmers level the ground and add fertilizer and water to the fields. The seeds are planted in April and they grow for four to five months. Around September or October, the first crop of rice is harvested; this is the only rice that will be marked and sold as shinmai. Rice that is labeled as shinmai is sent off to markets to be sold directly after harvesting while the rest of the crop is held in storage. The storing process leaves the rice to dry which results in loss of moisture and delicacy that comes with first-harvested rice. Shinmai doesn’t distinguish itself only by being the first crop of rice or by being sold in the same year in which it was harvested; there are also subtle taste and texture differences that, though small, give the rice a flavor that makes shinmai highly desired in Japan. Shinmai rice is generally more plump and moist than the rice that is sold over the rest of the year. The rice is also described to have a fresher and sometimes even sweeter flavor than normal crop rice. Shinmai rice is best enjoyed plain. One can also serve shinmai topped with an umeboshi, gomashio (sesame seed and salt), or with a pinch of sea salt to give it more flavor. Shinmai can also be made in to simple onigiri seasoned only with a bit of salt. Since shinmai naturally contains more moisture than regular rice, it’s best to store your shinmai in an airtight container in a cool, dry place to help keep the integrity of the grain. Shinmai rice also needs to be cooked differently than other rice, as the grains are more delicate than other batches may be. Because of this, it’s best to gently wash shinmai before cooking and to change the rinsing water more often so that it doesn’t get soaked into the grains. It’s also good to let the rinsed rice dry for about 15 to 30 minutes before cooking your shinmai rice so there’s not more moisture than needed in the cooked rice. 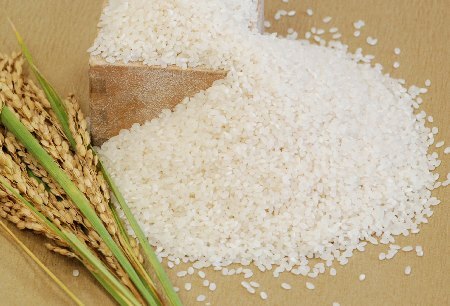 Since it hasn’t been dried as much as other rice, less water is required in the cooking process of shinmai rice as well. The usual water to rice ratio is two and a half cups of water to every two cups of rice, but shinmai only requires around two and a quarter cups of water for two cups of rice. It’s currently shinmai season, which means that we at Asahi are receiving our shinmai shipments. Right now we have white and genmai shinmai stocked in multiple brands. Shinmai rice is only around of a limited time each year, so be sure to buy yours before it’s gone!